Oxford at Sonterra Apartments in San Antonio, Texas offers spacious one, two, and three bedroom apartment homes. Located in the beautiful Stone Oak area, our apartment community is right off Loop 1604 with easy access to great shopping, dining, and entertainment. In our community, you will discover endless convenience, superior location, and modern style. With an impressive selection of ten unique floor plans, our apartment homes include highly-appointed amenities such as expansive, oval garden tubs, black kitchen appliances, and large walk-in closets. Our resort-style community amenities that will help you relax and re-energize. Take a dip in our Mediterranean-style pool, squeeze in a workout in our fully equipped fitness center, or enjoy the lush scenery of our golf course views. Comfort, tranquility, and convenience are all awaiting you at Oxford at Sonterra Apartments in San Antonio. 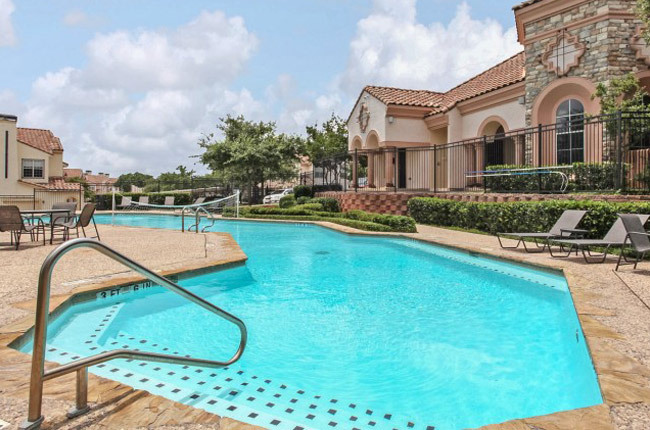 Tucked away on Huebner Road, Oxford at Sonterra Apartments offers its residents all of the conveniences of city life in a tranquil and peaceful setting. We feature close proximity to Highway 291, the Charles William Anderson Loop, and Interstate 10. For outdoor enthusiasts, we are surrounded by green space. Panther Spring Park, RidgeWood Park, and Canyon Springs Golf Club are all nearby. If you prefer indoor recreation, you will be able to find plenty of entertaining activities. You will not be able to locate this magnitude of quality restaurants in any other area. From Tex-Mex and vegan to American comfort food and barbecue, each night of your week could be satisfied by a different type of cuisine. Shopping has never been easier with a Walmart Supercenter, H-E-B Plus, and Target in the immediate area. Come see all that our central location has to offer you at Oxford at Sonterra Apartments.